Redhook Ale Brewery is a 360,000 barrel per year operation with breweries on both coasts. It was founded in 1981 by Paul Shipman and Gordon Bowker and is therefore one of the oldest brands in the American craft-brew scene. Anheuser-Busch (gasp!) now owns a minority share of the company, allowing for a proper distribution network. Let's hope that's all they're contributing to the company. 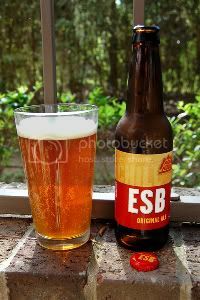 Verdict: Redhook ESB is a very drinkable and complex bitter ale. Don't be spooked by the new packaging, this beer is still a world-class icon. I can see enjoying a few rounds of this in a beer garden during a sunny Saturday afternoon or in a pub with some mates on a Saturday night. I guess the takeaway here is that this is a great beer for Saturdays. Tried a few of these the other day, and they were delightful. For a full review check out www.barbeerians.com!